Barbara Tober’s influence over the evolution of contemporary weddings is incalculable. As Editor-in-Chief of Brides, she sent a message of empowerment to women that resonates to this day. Fairweather publisher Alexandra Fairweather spoke with Tober about her work, both past and present. How did you begin working at Vogue? What was it like? After several “training” jobs in the advertising and magazine business, I felt the time had come for me to go to Vogue, which was always the epitome of style and fashion. On July 5th, dressed in a summer suit I considered appropriate for the occasion, I arrived for an interview at Vogue Editorial on July 5th. At that time, Conde Nast published not only Vogue, but Glamour, Mademoiselle and House & Garden. I specifically wanted Vogue Editorial and asked for it. There was a question of “salary;" I asked for more, they offered me less. I concurred. Happily in early August a phone call invited me to start after Labor Day. That was the beginning of my career at Conde Nast, which lasted over 32 years. 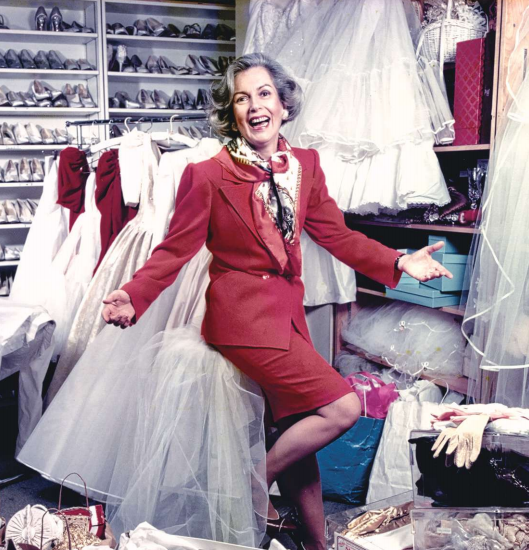 Vogue was, in those days, the most glamorous place on earth, with the possible exception of the living rooms of Babe Paley and Pat Buckley to name one or two. These elegant women, dressed in Mainbocher and Galanos along with some of the “newer people” later on like Oscar de la Renta and Bill Blass were the celebrities of the time. They “dressed” to go shopping at Bergdorf, and appeared constantly in the Society Pages. I worked for Despina Messinesi, a Greek socialite who presided over “Mrs. Exeter” (for the “mature” elegant woman) and children’s apparel. And there was Grace Mirabella who did “sportswear” which was just coming into fashion and mostly meant silk and cashmere separates and other casual, but elegant clothes. Grace later became Editor-in-Chief of Vogue. At that time, the fashion world was going “international” so Jackie Kennedy’s sister, Lee Bouvier inhabited the area, editing her collection for the Brussels Fair. 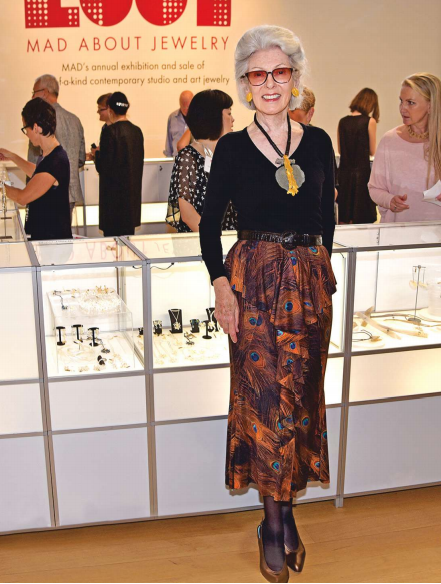 Irving Penn’s wife, Lisa Fonssagrives, was everyone’s idol as THE model to emulate, but by that time she had retired to rear her daughter Mia, who became the famous jewelry designer we all know today and married a real estate mogul. We had to go through a “jury” that pronounced whether or not we had chosen the “right” accessories, which at 3:00 a.m. was devastating if you were wrong, but celebratory if you were right. This exercise proved to me how elusive is the concept of “taste” as the judges pronounced which shoes, what hat, which pin was “right”. Being in Vogue was a lesson in determining taste, style and quality. Quality is easy to recognize, but “taste and style” are always in the eye of the beholder. They still are as we examine the see-through apparel chosen by the stars of today. Those dear ladies would have fainted dead at 4:00 a.m., but now these beautiful bodies are exalted with/without clothes in the media wherever they appear. With head up, eyes on the goal and feet on the ground, one had to move forward in spite of any glitches. I learned then that in spite of “putting the wrong pin, earring, shoe or hat…” on the model, one should never think of oneself as a “victim” (which is the favorite pastime of today.) I learned to take “being wrong” with good humor and carry on. How did you start working at Brides? I left Conde Nast at one point to take another position at a publishing company that promised greater possibilities. There were at least 11 magazines that could benefit from beauty and fashion information, so I set out to provide them with this service. A couple of years into my tenure there, I got a call from Mary Campbell, Director of Human Resources (as they term it now) of Conde Nast asking about my current status. She offered me the title of Editor-in-Chief of Brides Magazine. I was intrigued so I prepared an illustrated proposal over the weekend and delivered it on Monday morning. The next thing I knew I was meeting the President, Iva Patcevitch, a charming man who after a friendly interview must have endorsed me because I got the job. I answered his question “How do you feel about marriage” by saying that I thought marriage was the most idyllic way to live IF you happened to be happy with your spouse. (The former editor was separated from her husband and the magazine reflected her malaise.) He pondered my answer for a moment, then said, “I’m married for the second time and I am very happy” at which time we both quietly laughed and I could tell he felt calmed by my positive answer. How have weddings evolved over the years? How did you change the landscape of weddings in America? Brides Magazine was a flurry of wedding dress photographs, a smattering of etiquette rules, some editorials on "how to set the table," and so forth. There was also a Brides Book of Etiquette that set out time-honored rules that had been established for decades before. There was also a Bridal Registry Manual which still exists today, but it is now on the internet and often part of the couples’ own web site. Basically what we did was to listen to the public: How were they marrying in the mid-60’s. The nation was beginning to change in major ways. Swedes were marrying Cubans; Italians were marrying Jews. Religions were important to many so couples had two officiants. Russians were coming to the U.S. after “group weddings” in Moscow and wanted something more personal. Asian weddings were grand and glorious; the bride changing two to three times. The subject of who’s marrying who became more important than how. That’s when people began to rebel against the rules that had kept the wedding ceremony so sterile for so many years. They were delighted to follow our lead and plan for more personal joy. They began to asked questions… and we answered them! “Why can’t the groom’s family appear on the invitation as it does in France?” “Why does the bride’s family have to pay for all when both families are involved?” “Why does only the bride appear in the engagement announcement?” “Who should be invited to the wedding; I don’t want only my father’s clients!” As many questions evolved as there were weddings, and we expanded the Etiquette Book every couple of years to keep up with the changes and to answer these questions. We wanted couples to have the wedding of their dreams, not just their parents’. This was the mantra of the moment … and still is! Do you have a few rules you could share on what to do versus what not to do when planning a wedding? For me, the fewer the rules, the better. But here are some thoughts on how not to make your guests suffer. a. Plan the ceremony time close enough to the party afterwards so that people can go from one to the other without “hanging around” for several hours… Especially if they’re from “out of town." b. Don’t start serving alcohol so early that guests find themselves tipsy by dinnertime. c. If you are having a multi-generational party (grandparents, parents, siblings, friends, and kids) keep the event short enough so everyone doesn’t get exhausted/drunk before they leave. f. If there will be children, try to enlist as many of them as possible in doing “tasks” that will be part of the celebration. If they’re the “impossible” sort, forget it and have someone take them home early. g. The message truly is: Enjoy yourself but think about those whom you have invited to celebrate with you. Make it fun and safe for them, and get everyone home fairly early. Do you have a favorite wedding you featured in Brides? Actually, we never featured weddings in Brides, but left that to Town & Country, etc. We were always dealing in theory, the “ideal” way to do something, and we photographed people and situations in that way, including reception tables, etc. One exception I’m particularly proud of, however, was not a “wedding” per se, but an engagement. I discovered a couple whose photograph together was published in a Westchester newspaper, and I printed an editorial of the two of them together along with their engagement announcement citing a trend. This started a flurry of excitement and agreement, because all across the U.S. “hometown” newspapers were doing the same! It took the NYTimes several years before they caught on. Now, of course, every couple is photographed together, and often their story is told. But in early days it was only the engaged woman who was considered important enough to be photographed. Who are your favorite wedding designers? Top designers such as Pat Kerr, who created dresses from the most precious laces in the world and is still designing everything from Bridal dresses to flower girls and christening dresses, are choices of a number of brides today. So is Vera Wang, whose store on Madison Avenue is the beacon for many celebrities. These days, however, there are so many evening dress designers who create glorious gowns for the bride which means that the bridal industry is no longer a specific world of white, separate from any other. In earlier days, Priscilla of Boston, Alfred Angelo, Milady Bridals, Jim Hjelm, etc. created specific shows for the press and the stores several times a year, but now the furrier Dennis Basso, for example, creates wedding dresses for sale at Kleinfeld’s on West 20th street which is THE emporium for the total wedding, flower girls and all. There are endless choices at every price; many are made to order but if one is able to fit into a sample, that with a few alterations will work just fine and there’s major money to be saved. How can anyone select one person? For literature, I enjoy Simon Winchester for his mellifluous text, love of language, deep knowledge and wide interests. For art, the superrealists such as Richard Estes, surrealists such as Salvador Dali and Magritte, and I just bought a work by Anne Siems called “Smoke and Fire,” which just arrived in our apartment and is already in place. It is evocative of my teenage life; indeed in many ways, the life of a woman. We collect Dale Chihuly, William (Billy) Morris, Wendell Castle, Dan Dailey and many other giants in the world of arts and design. The MAD Museum considers them masters of our field. I also have some outstanding art jewelry which is not noted for its precious jewels or metals, but for its artistic integrity and imagination. For business, I found my role model very early on at Vogue in the person of Catherine McManus who later on married an Italian count named de Montezemolo. My desk was near hers and I always heard her say, “How can I help you” and “Thank you so much for your help” and so many other welcoming, friendly and thoughtful phrases on the telephone that I determined she was my role model for the future. Never wavered from that and we became friends. For innovation: I’d pick Richard Branson. Oleg Cassini once said to me, at the end of a long flight to San Francisco, “The first person you will meet as you get off this plane is you!” because we were talking (in the 60’s) about the fact that so many people were going out to California to “find themselves”. He was a man who definitely had found himself, and was completely at home in his own skin. As dressmaker to “The Queen” (and I mean First Lady Jackie Kennedy) he had found peace and contentment with his life and friends after having been driven away from his home in Russia. I have learned that one has to be content not to have everything, but to have the best of something so you can find peace. If elements of life go wrong and one reacts destructively, one enters the downward spiral. That’s where drugs, etc. are today, and to find solace in that world is the beginning of a sad end. What advice would you give a bride to be? Don’t expect heaven on earth the first or second year of your marriage; actually never. There is no “heaven on earth.” But there is great happiness, and you have to create it yourselves. Depending upon how old you are and how much “baggage” you have from your former life, it can take a while to feel “at ease”; perhaps even longer if you’re older. You need to get into a rhythm of disparate behaviors without either getting bored or irritated with each other. Then you start reaching out to enrich your lives with new ideas, activities, friends, careers, interests…. Older couples already have a foundation of friends and activities while younger people often develop their most fulfilling lives together. The world is huge and you have only begun to investigate it. And then come …. children! But that’s another story. What are the keys to a successful marriage? Just be nice to each other. You can differ on politics, on money management, on taste and whether to open or close the windows at night. But if you can come to some sort of agreement on how to please each other (alternatively or separately) then your arguments are over or at least on level “Calm.” I know that sounds overly optimistic, but there’s no way two people can think exactly the same throughout their lives. Money, for example, is (yes) the root of all evil, etc. but if you can establish rules for management – even if you have to engage an “outsider” to create a list of fiscal “behaviors”, you will be able to live in reasonable harmony. People with absolutely no self discipline, however, do get into trouble, and I’m afraid that I have no advice for them except to try to adapt. If you can’t, there’s no recourse but to go and get professional help. Where did you and Donald meet? When you are single, the dating game is a game. People forget that, and they expect someone they just met to become instantly close without examining the “space” that people always create around them. Thus began my friendship with my beloved. I was invited to a dinner party by a couple and had a “date” with the French teacher, but didn’t want to extend my hand of friendship too far. So I invited him to be my companion at the dinner party. There – on the sofa across the room – was this tall, lanky man with a “halo of energy” around his head and I thought ‘Oh, no, I’ve been there already.” But we spoke, enjoyed the dinner, he played Rogers & Hart, Hammerstein, etc. on the piano and I sang (love to sing). Definitely I felt more comfortable with this “new energy” and when Donald called to invite me to the Ballet, I accepted with delight. The rest is our history… for the next 44 years so far. We dated, talked incessantly, spent lots of time together, examined our lives, our hopes, wishes, fears and concerns. After probably thousands of hours of discussion, he asked me to marry him at a dinner in someone’s home. We announced right there and then, and set the date a week later. Of course I had to say “Good Bye” to my other charming friends, and he had to do the same with his, but we married a year to the day that we met. So sensible that was, we can never forget! Please tell us about your role at the Museum of Arts and Design? After 43 years in the corporate world I left my “home away from home” at Conde Nast to become Chairman of the Museum of Arts and Design. In 1994, I had reached the age of 60, accomplished absolutely everything there was to do at Brides Magazine over those 30 years including all the media and public relations activities, trained a woman 20 years younger than me to take over, and I wanted a new life. Next step was a ski vacation, the Christmas holidays and right away, we began the new “regime” at MAD as we call it now. There was much to do, but I had been involved since 1981, elected to the Board in 1989, and so very familiar with the inner workings. We needed to straighten up our finances (what Museum doesn’t? ), to secure some Blockbuster shows, to expand our constituency and mostly, to be visible on the street (opposite MOMA.) This proved to be next to impossible so we made plans to move to a new location which is where you find us now at 2 Columbus Circle. The story of how we maneuvered between success and failure during the next several years would take a book, but suffice it to say that we “put our shoulder to the wheel,” gave it everything we had, and moved forward from a relatively obscure art facility to the Museum of Arts and Design we are today. Are we as big as…. MOMA, Whitney, Guggenheim, or even the MET? Of course not, but we are a Museum of contemporary surprises, of new ideas and creative artists from everywhere in the world that others do not necessarily embrace. Moreover, we represent the vast millions of creative artists, artisans and designers in the “middle class” who practice their art, do business and sell on the internet to Australia, Argentina, Indonesia, the European Union…. everywhere in the world. This is not the market of extravagant prices and celebrity painters (although we do have a couple of famous artists in our firmament.) This is a special assemblage of artists and designers who are passionate about their work and have a dedicated global following that transcends the traditional Art Market. I believe in elegance and a sense of decorum, but I can balance that with great joy and a warm embrace. Trying always to look well groomed is the goal, but there’s still a need for the gym and one has to “let down” once a while in transit. The answer is: No matter the situation, be ready to greet others with a smile and a kind word. That transcends style anywhere in the world. What is your greatest virtue and biggest vice? It’s difficult for me to answer this, but my husband says I’m very (ridiculously?) friendly, which is actually true. I thank policemen on the beat, praise waiters, doormen etc. when they do a good job, appreciate salespeople and others who happily help us live the kind of civilized life we prefer. Yes, I know there are those who do not wish to involve with others, some who absolutely hate their jobs, but I prefer smiling and being pleasant to everyone with whom I have some sort of discourse. In 90% of cases, I receive a positive response. If not, I just move on; usually feeling sad for that person. As far as my vice is concerned: Donald says I just work too much, but I love to write and that takes time. If you’re not a writer, you can never explain how long it takes to carve the perfect sentence or discover the ideal word to describe a situation, person, feeling. Unless of course, you’re one of those authors who can write a perfectly researched column in 20 minutes (like William Buckley). It would be nice to have one’s obituary in the New York Times without paying for it. But all kidding aside, I like taking something small and making it bigger. But I believed in the “Pair Bond” and Margaret Mead’s anthropological philosophies so I soldiered on. We were right and the world changed with us. The Museum of Arts and Design was “American Craft Museum” and people said “craft is doilies and macramé” who needs a museum? Now “doilies” are 3-D printed lace and macramé or a bold new Rope sculpture in Chelsea (to name but two examples). We re-branded to MAD and moved to 2 Columbus Circle which is the acknowledged center of New York right at Columbus’ Statue! Some of the best times in my life I’ve enjoyed on the back of a horse. I taught riding to some littler kids when I was a pre-teen and earned enough money to buy a Brownie camera and an Audubon Book of Birds. Then I just rode all the horses in the stable until at 15 they were sold to my great sorrow. Later on, married to Donald, we started riding again. He, the athlete, learned quickly, we began jumping, traveled to horse shows then joined the Goldens Bridge Hounds and went galloping over hill and dale in chase of … a fox, deer, whatever. The idea is not to catch but to chase. Even the “target” gets some joy out of it; there are many stories to back this up. We rode the route of the Duke de Lauzun from Connecticut to Yorktown, VA to celebrate the surrender of Cornwallis. Then, at the invitation of the Lafayettes, paraded up the Champs Elysees on the Garde Republican horses to celebrate the Treaty of Paris. Cheers from grandmothers to children resounded on either side from the Ronde Point to the Arche de Triomphe. This fall we are hosting the Hunt Ball for the Millbrook Hunt, and we enjoy riding for miles through breathtaking countryside that is admittedly “at risk” for urban sprawl, but thus far, has escaped. Later in my 40’s I learned how to ski. This was a revelation because once you are proficient, you can cruise to your heart’s content down all the green and blue slopes and you feel you’re flying. This has been a favorite winter sport for us for decades, but recently the threat of snowboards and those who recklessly command them, plus altitude and knee problems have prompted us to say goodbye to the snowfields of Vail, Aspen, Gstaad and Courcheval. Still, there’s always scuba diving; went to the Great Barrier Reef; that was worth the trip. And other outdoor pleasures… did a Parachute Jump in 1964, probably won’t do that again. Just keep moving; there’s lots to accomplish out there. Perhaps I haven’t found it yet…. There are fabulous memories: The Patala Palace in Tibet; the ladders one climbs are so slippery from all the Yak butter. Then there are magnificent palaces, shrines, churches, mosques, chateaux, temples and other monuments in Italy, France, Turkey, India, China, Russia, Poland, Mongolia and on. Don’t leave out the wildlife of Patagonia and South Africa… so much to see over the past 70 years since I left childhood. Often I feel hesitant to “go back” because there will be skyscrapers instead of charming little streets, and clear cut fields instead of forested mountains full of creatures big and small. Civilization is often the enemy of natural, untamed beauty, and we couldn’t drive through Kenya again for sure. Maybe Veradero Beach again and the jungle in Cuba is the next challenge. What is your favorite place in NYC? Home Sweet Home…. of course! But every day is an adventure in this city, especially when your daily life encompasses challenges, business, philanthropy, friends, activities, theatre, ballet, opera, museums, food adventures and the odd event you never thought you would attend. New York is full of surprises, but that’s why we all live here.